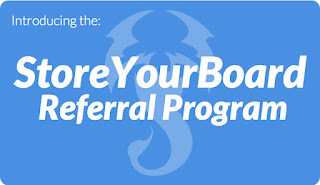 If you love surf and SUP gear and want to earn free gear, sign up for the new StoreYourBoard referral program. 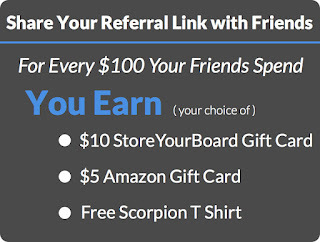 All you have to do is share StoreYourBoard with your friends, social media followers, whoever, and when they buy from StoreYourBoard you get credit for Amazon gift cards or gift certificates to StoreYourBoard. Once you sign up for the referral program, you'll be giving a unique personal link. Share that with your friends on twitter, facebook, instagram, your blog, email, etc. and tell your friends to get some racks or gear from StoreYourBoard. We've preset an email to your friends for you that explains the program, so all you have to do is type in a few email addresses and you can start referring and earning rewards. What are the rewards? If your friends spend a combined $200 dollars, you get either a $10 Amazon gift card or a $20 StoreYourBoard gift certificate!